Top Parenting Hacks For Babies, Toddlers, Preschoolers and Teens! Struggling to manage your kids? Are they costing you the earth? Do you need a few tricks and tips to stop you losing your mind? We’ve scoured the internet to find the best parenting hacks around to make your life a little easier. Read on to find out more. How often have you been just about to start feeding your child, only to find that his/her bib is nowhere to be found? Bibs are small and easy to lose, so wouldn’t it be great if they were always in one place. Just use one 50p command hook from the supermarket and you can hang all your child’s bibs on the back of their highchair, so you know exactly where they are. Babies socks are small and easy to lose. They get dropped, left in laundry bags, stuck in the dryer and anywhere else you can think of. Fortunately, there’s an easy solution. The same sort of mesh bag that you use for your delicates is perfect to keep socks together in the wash.
You can also put bibs in there to stop the Velcro catching and pulling on the rest of your clothes. It’s easy to forget whether you’ve given your baby their medicine or not, or if your other half has already done it. 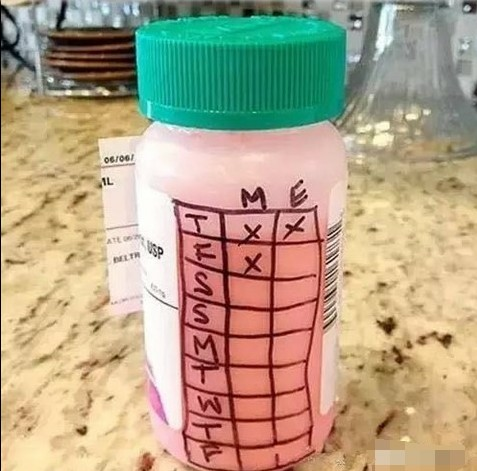 Keep a record of when it’s done by writing a chart on the bottle and marking off when it’s been done. Do it in permanent marker and if you run out of space then clean it off with nail polish remover and start over. No, they can’t have a Facebook account just yet, (Facebook may not be around in 10 years’ time) but sign up for a Twitter handle, Gmail, Instagram and anything else they may want. They’ll thank you when they’re older and they don’t have to use johnsmith7892340892423049@gmail.com as their e-mail! Have a look at this video for more great tips to help with your baby! Kids grow out of bibs, but not out of making a mess! Buy a cheap, oversized t-shirt or use a hand-me-down that they can wear over their clothes whilst they eat. That way you’ve only got one t-shirt to wash and if the stains won’t come out you’ll have no problem throwing it away! No-one likes chores. Period. But if you get your kids started early they’ll be used to doing them when they’re older and grumpier. You don’t want to expose them to any chemicals, so the best thing to do is start them off with a damp microfiber cloth. That way they can’t do any damage but will feel like they’re helping. If you want to get them started really early, then this microfiber baby onesie is the perfect present for your child! Aside from being fun to play with in the pool, pool noodles are great for helping out at home. If your child keeps rolling out of bed at night then a pool noodle on either side of the bed under a fitted sheet provides a ridge to keep them put. You can also use a pool noodle to keep doors from closing. Just open it out and place it around the top of the door and the door as an easy door stop. Sinks can be a bit big for toddlers and it can be hard for them to reach over to wash their hands. Use an old plastic bottle to create a flow for the water so they can easily wash their hand without you having to be there to help! 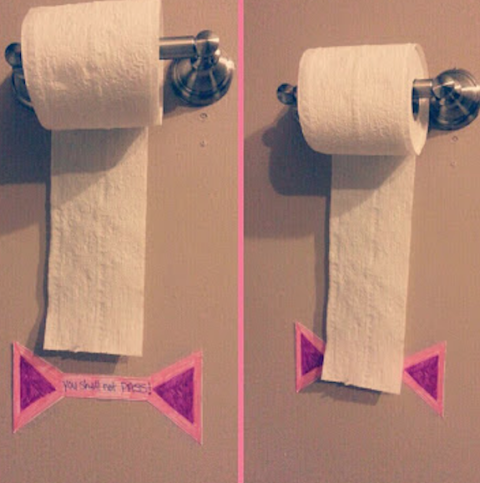 Prevent your child from blocking the toilet with paper by telling them exactly how much paper to use every time with a colourful “toilet paper line” on the wall. That way they won’t be so wasteful every time they go, and the plunger can remain in the cleaning cupboard! Children like to make a mess and leave you to clean it up. Fortunately, there are some easy solutions to common messes. Markers and crayons – Easily clean these off with toothpaste. Just apply a small amount onto the stained surface, rub it hard with a jay cloth and wipe away, leaving your floor spotless. Glitter – A lint roller is ideal for picking up glitter off any hard surface, but for carpets you’ll still be finding it months later, no matter what you do! Having your children running around a carpark is a nightmare for any parent. Train your kids to be safe when you’re out with a Parking Pal “Safety spot” on the car. That way you’ll know exactly where they’ll be and you can stop worrying about them getting in an accident. Every kid loves a ball pit, so why not make one at home? Use an inflatable pool as an easy alternative and your children will love you! You probably already have a pool for the summer that’s unused all winter, so you’re getting extra use out of it with very little effort! If you liked these then have a look at this slideshow for some more ideas! Reading helps your child transition from day mode to bedtime, providing a break between all the running around and going to sleep. This can significantly improve the quality of sleep they get, and a better night’s sleep means they won’t be as crabby the next morning. Reading together also helps with their reading and comprehension skills, and you can use it as an extra teaching opportunity to introduce them to more words and broaden their vocabulary. Again, although may not seem like a hack, not all hacks need an arts and crafts kit to help you out and as your kids get older you’ll find this more and more! At this age, children are learning a lot, and many of their habits and behaviours that they’ll have for the rest of their lives are being ingrained now so it’s important to get it right! School uniform gets a pretty rough time, so save yourself the hassle of having to sew buttons back on by keeping them on in the first place. Just apply clear nail polish over the button to keep them from falling off. Getting out the house every morning can be a rush, so create a dedicated space for all their school stuff to make the school run less stressful. Use Hooks and trays on the wall for their coats, bags, shoes and anything else they need each day. Your child’s room will probably be a mess from now until they leave home. Yes, they may have a floordrobe, but if you don’t see it, why does it matter? Wouldn’t it be easier to just close the door and not have to look at it? If you’re having to deal with a grumpy teenager then a great way to get them out of it is to give them responsibility. Whether it’s navigating the way around the water park or getting certain items on the weekly shop, giving them jobs to do is a great way to make them feel important and in control! Every parent worries about what their children are doing when they’re not at home, so make your home a place your kids want to be. Give them their own space, stock it with some crisps and drinks and then leave them well alone. Let them know you’ll give them space as long as they don’t make too much noise and they’ll be perfectly happy to hang around at home. If your Teen gets a “no” from one parent, they’ll probably just go straight to the other one to ask again It’s important that you’re both on the same page, so send each other a message with what you’ve said. You also need to be consistent from week to week. It’s no use telling them they can go out with their friends one weekend and not the next if nothing has changed. This will just infuriate your teen and lead to arguments. These parenting hacks will not only save you time, they’ll also allow you to be a bit more relaxed. At all stages of your child’s life there are little things that you can do that will make everything a little easier for you. Got any others you think we should have? Feel free to comment below and we’ll pick the best ones for our next post!